In this era, mobile phones are more popular than computers and books. Mobile phones are easy to carry around. If you’re a student, professor or an autodidact, you don’t have to buy a 400 or 500-page book from a local market to hone your skills and knowledge. The book author may have published the book online in PDF format. The PDF file will be an exact replica of the book. If the file doesn’t have graphic content, its size will be about 5 MB. As smartphones have a large amount of storage memory, you can save 100s of eBooks on a smartphone. If you can’t buy an eBook, download the following learning apps on your mobile device. The apps provide free courses on various topics. They have practice tests so that you can prepare yourself well for the school, university or any other competitive exam. 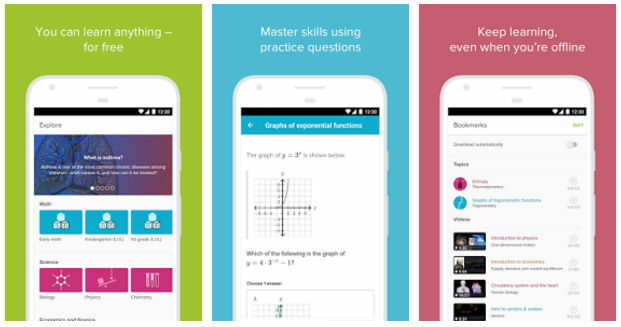 Khan Academy is the most popular app for learning math, science, biology, physics, etc. It features over 10K lecture videos compiled by experts in their respective fields. KA provides practice tests covering 30000+ questions and answers. Hence, it is a great app to prepare for IIT-JEE, SAT, GMAT, MAT entrance exams. Khan Academy lets you track your learning progress. 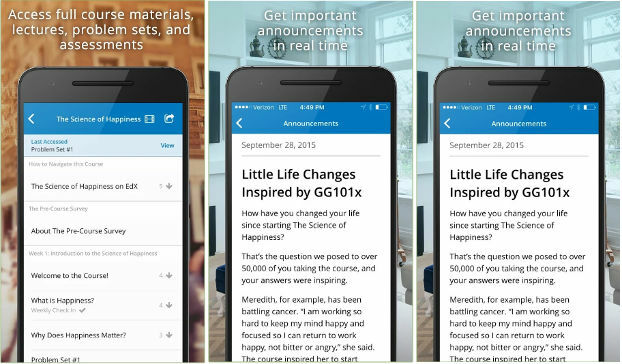 To inspire the users, the app rewards users with badges for every course they complete. KA lets you bookmark videos for later access. It has a huge collection of high-quality study materials. It provides a search button with advanced filters through which you can find courses online quickly. 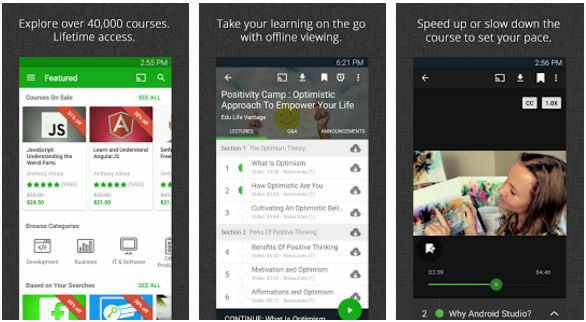 Udemy is a free app through which you can learn almost everything that can be taught. It lets you follow and rate instructors. You can also ask questions to the experts with Udemy. Account registration is an optional step in Udemy. The app allows you to go through the toned down version of the courses for free. To download or unlock the complete course, you must buy it. According to the developer, Udemy has 1100+ courses in PDF and video formats. You can configure this learning app to download courses over a mobile data or WiFi connection..
Lynda is yet another excellent learning app for Android and IOS devices. It is a premium learning service that was introduced by a self-trained professor. When you join the Lynda membership program, you’ll get access to tons of video tutorials. Lynda offers 30 days free trial to the users who want to check the quality of videos and the instructors before becoming a premium member. Lynda has a massive collection of videos in 13 different categories. The videos courses are aimed at improving your technical, marketing, and business skills. The app allows you to create and save a playlist of educational videos. It can autoplay videos in the playlist. It enables you to stream videos to TV with Google Chromecast. 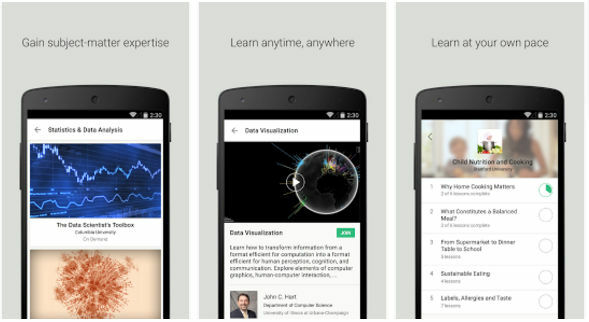 Coursera is an online learning app that brings lectures from the world’s top universities to your mobile device. It allows you to see the syllabus of the course you’re enrolled in. It lets you watch video lectures and participate in quiz tests. Coursera enables users to download lectures and it has the option to control the video playback speed. Once you finish a course, this application will reward you with a certificate. You can share this certificate with the company HR or your friends to prove that you’re a skilled person. Coursera has free as well as paid 800+ courses. It lets you take courses in science, technology, programming, arts and design in various languages. EdX app covers video lectures provided by experts working at world-renowned universities and organizations. It helps in improving the skills and self-confidence of the users. Once you have taken a course, you can undergo quiz based tests. EdX allows users to download videos for offline viewing. The app offers courses in over 100 science topics. To explore the topics, you must register a new account or sign in with the FB or Google account. EdX app has an interactive user interface. After completing a source, EdX will provide you a certificate signed by the instructor. You can mention this certificate in the resume. EdX is the smallest application on our list of best learning apps. Information Technology is one of the industries where the fate of the employees depends on their skills. To survive in the industry, you must improve your skills. The Udacity app can hone your computer science skills for free. It can also help you in learning advanced CS topics like VR, Machine Learning, Data Mining, etc. 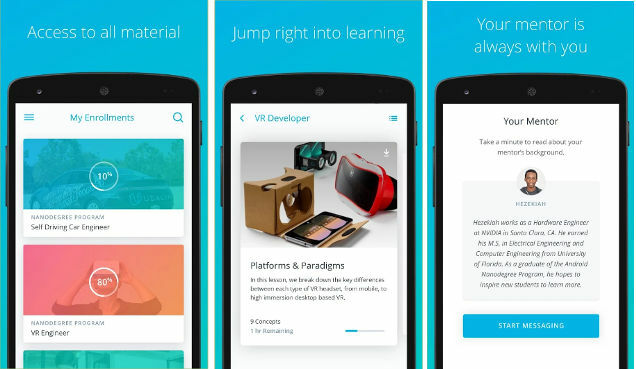 Udacity allows users to take courses compiled by expert instructors. 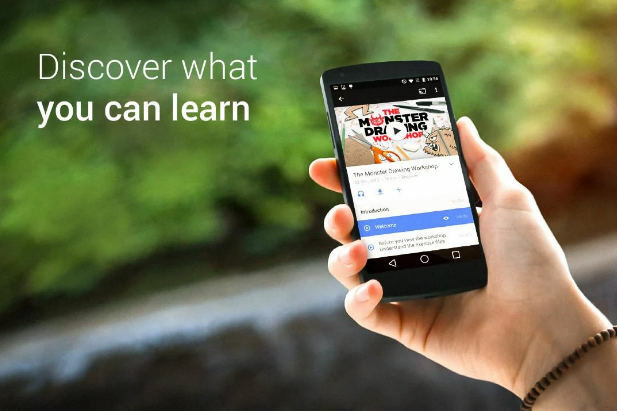 It lets you share courses on social networks. It provides a search utility. Udacity offers paid and free courses on various topics related to computer science. The learning app enables users to enroll for the Nanodegree programs recognized by prestigious organizations. The Nanodegrees add weight to your resume. Wikipedia is a great app for learning history, geography, political science, economics, chemistry, etc. It gives you access to in-depth articles on 1000s of topics. The articles are published by experts. You can translate them on the go in 290+ languages. Wikipedia doesn’t have advertisements nor does it asks you to register an account. If you want to contribute a new article or want to make corrections to an existing article, you must create a contributor account with the Wikipedia app. 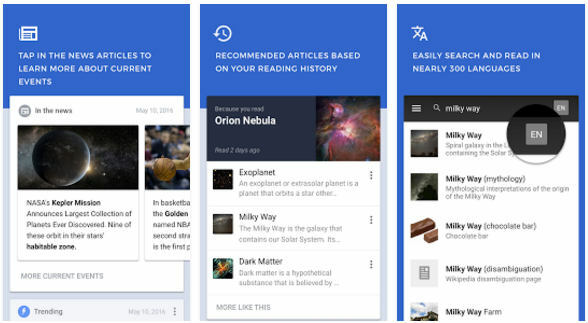 The application lets you bookmark articles. It has a maps section through which you can get details or read the history of nearby places. It provides a keyboard-based search tool and voice search function. When we come across an unusual story or topic, we try to get more details of the story details from the internet. When we hear a new word, we use an online or offline dictionary app to look up the word’s meaning. Well, humans beings are always curious. Although the brain stops growing at the age of 25, it never stops learning. To feed your hungry brain with knowledge, download and use the best learning apps we’ve mentioned above.